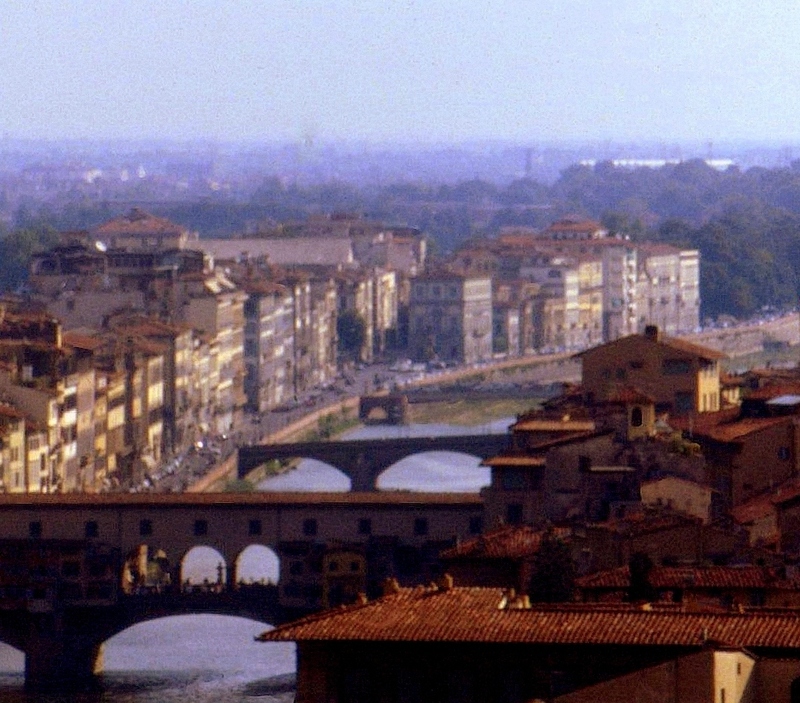 Arno river bridges, Ponte Vecchio in foreground, Florence, Italy. 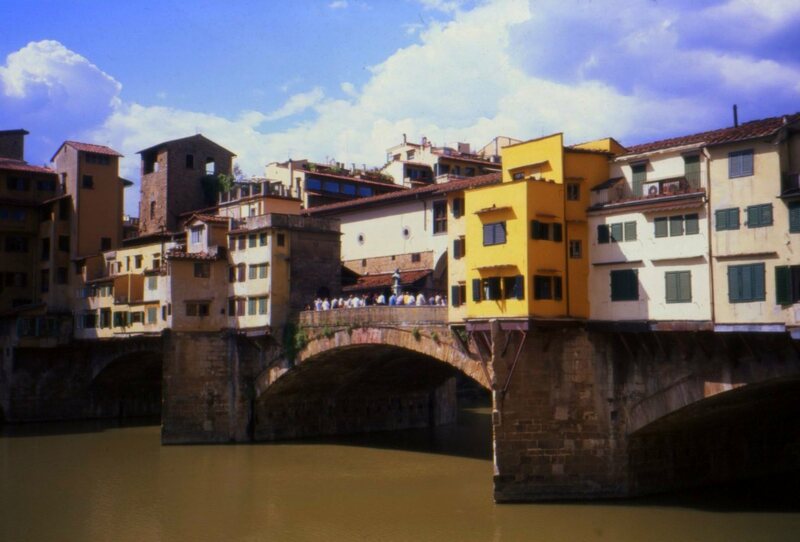 The much-photographed Ponte Vecchio is only one of the bridges which tie the halves of Florence together across the River Arno. It looks less like a bridge than like a village hovering above the water. Most of it is lined with shops, among which some seem to cling precariously to the bridge. And it is packed with tourists. 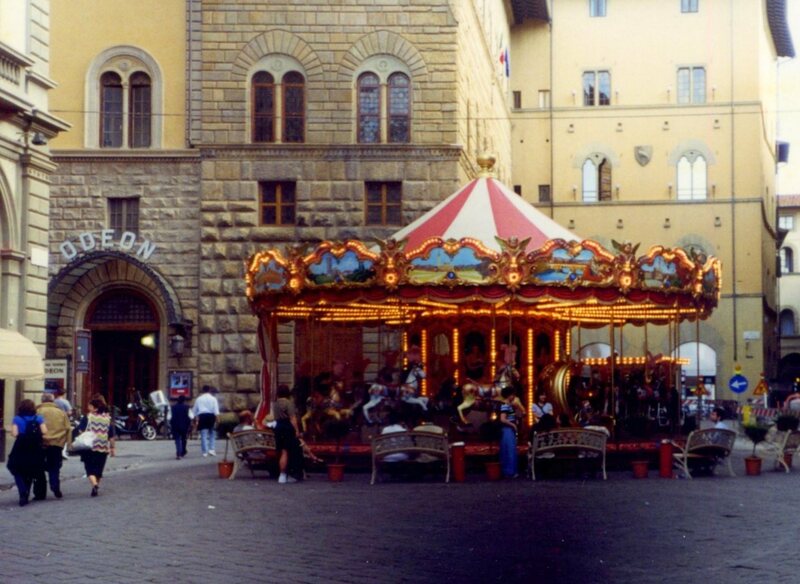 In fact, the real challenge in Florence is finding any spot in which there is not an ever-present reminder that visitors often outnumber locals, or that the twentieth century is ever pressed against this bubble of history. 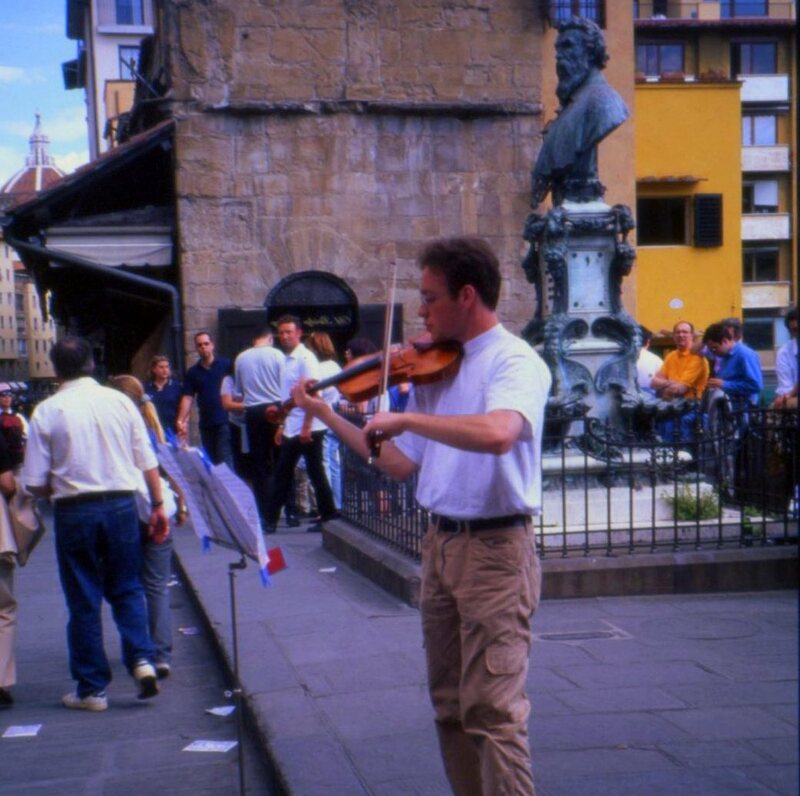 Musician plays for tips on the Ponte Vecchio, Florence, Italy. 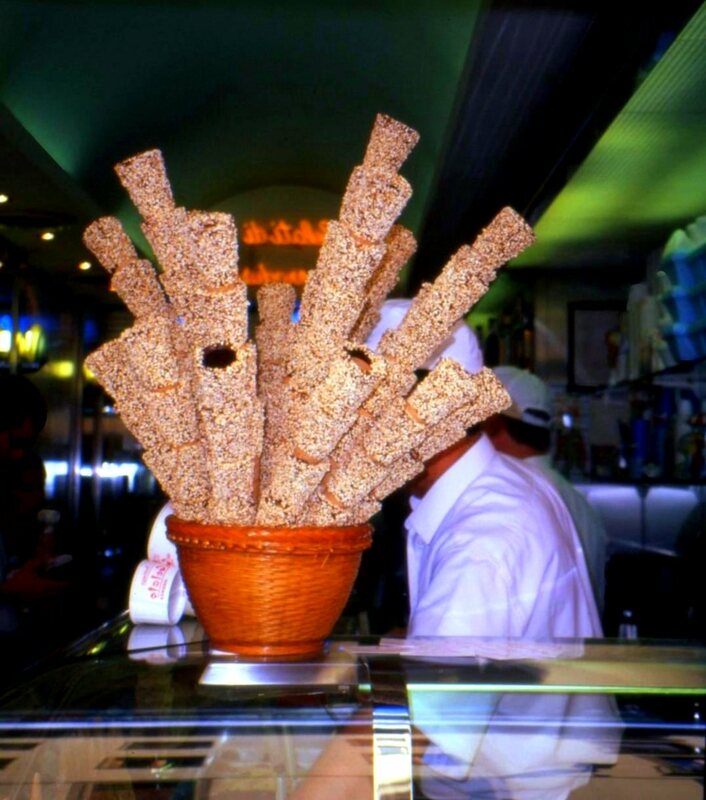 This city’s modest size belies its role as, arguably, the cradle of modern civilization. The list of notables who were either born or worked for much of their lives here is a list of Renaissance Who’s Whos. Writers Dante, Boccacio, and Machiavelli. Artists Leonardo da Vinci, Michelangelo, Botticelli, and Donatello. Navigator and mapmaker Amerigo Vespucci. Architect Brunelleschi, who designed and built Florence’s signature Duomo. And, of course, the Medici dynasty, whose power extended to Papal Rome and the court of Paris. The family’s legacy survives as the private art collection now open to public viewing in the Uffizi Gallery and the Pitti Palace. 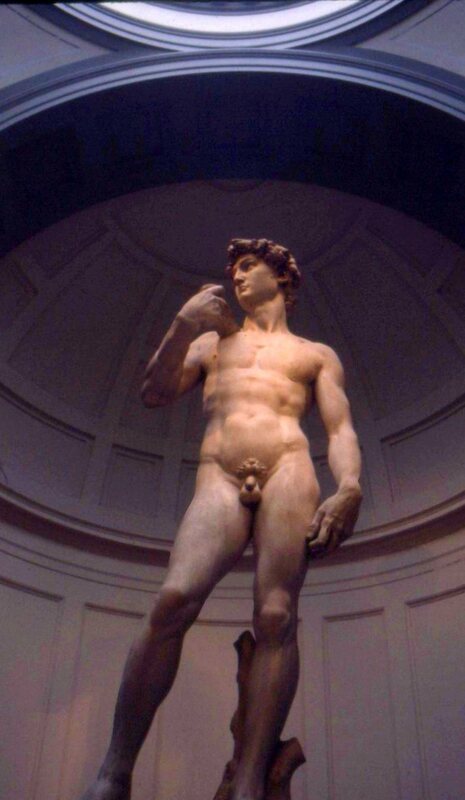 In Florence, works of art are not just reserved for museums and galleries. Classically inspired sculptures fill its piazzas and crown its fountains, turning the mundane into public works of art. 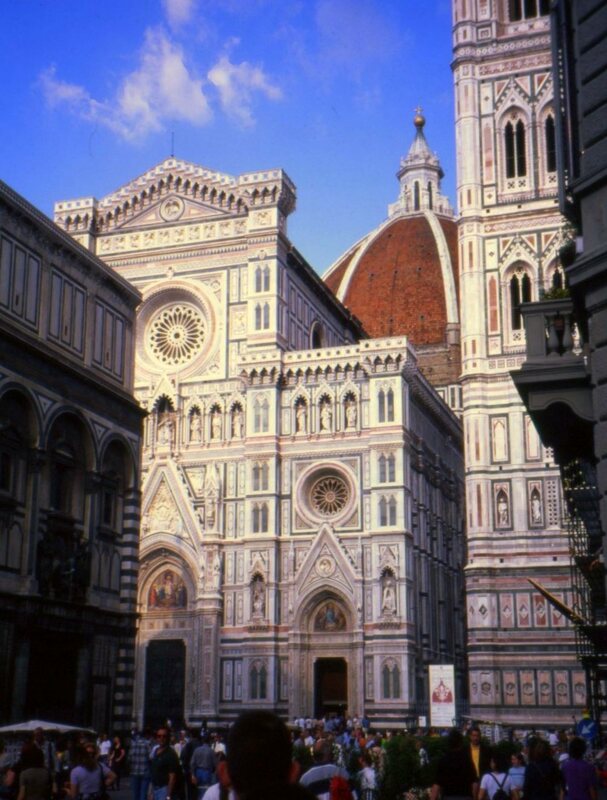 The Duomo of Florence’s signature Cattedrale di Santa Maria del Fiore rises up out of the surrounding neighborhood as if it had been thrust up from the depths of the earth. It is the first structure of its kind ever raised without supporting framework. Its scale is so staggering that it is visible only in piecework glimpses from the surrounding streets, and in their dim light it often appears in monochrome. 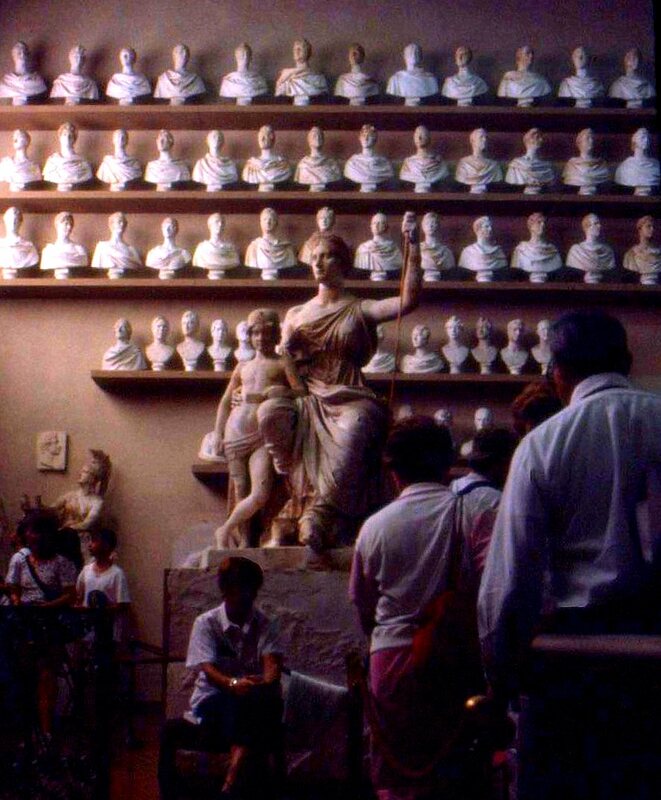 Homework sits in a sculpting workshop, FLorence, Italy. 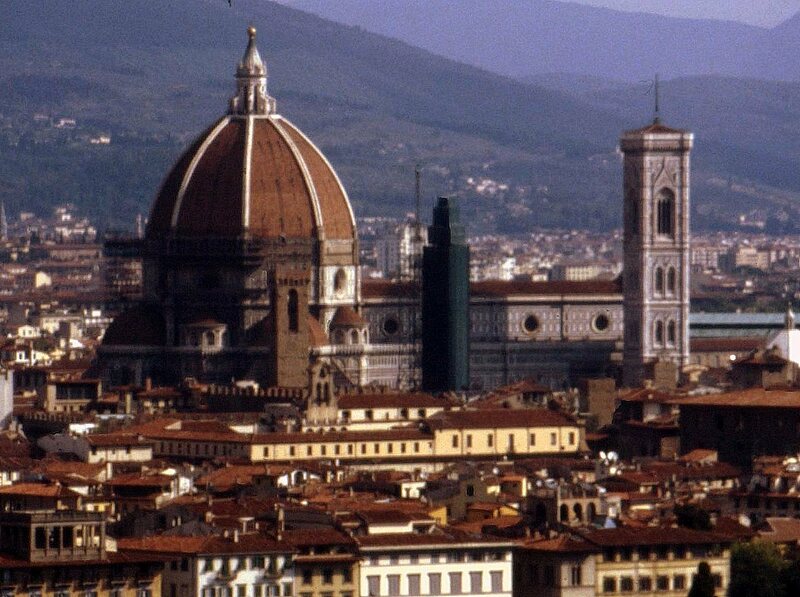 Duomo and baptistry mark the signature skyline of Florence, Italy. It’s hard to appreciate the effect that this place must have had on the ordinary citizens who went about their daily business in its shadows. To approach the cathedral is to fall deeper and deeper into an image that continually reveals new details unseen in full frame. The scope of the elaborate, hand-chiseled details is mind-boggling. 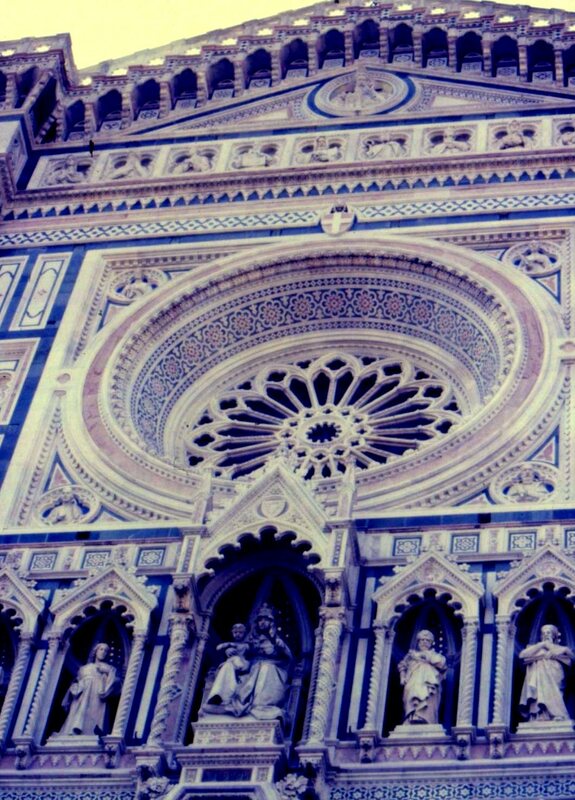 Duomo and facade, Florence, Italy. It’s no surprise that it took more than 140 years of labor before first services were held, or that the final touches were not added to the facade until 500 years after construction was begun. It’s about a ten minute walk through narrow city streets to the piazza from which the facade of the smaller Santa Croce Basilica is fully revealed. 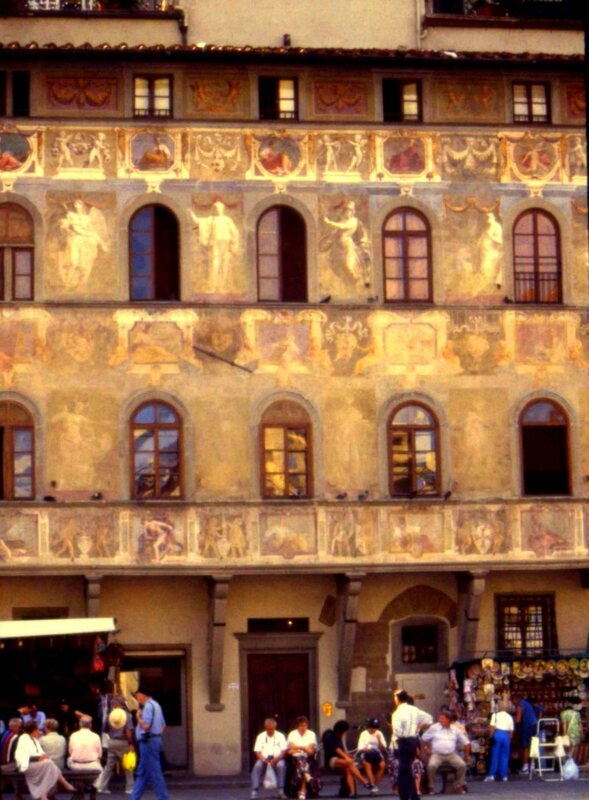 Medieval buildings around the piazza add to its sense of timelessness. Medieval facade across from Santa Croce Basilica, Florence, Italy. The Basilica is the largest Franciscan church in the world, and the Franciscans’ appears prominently on the facade of the temple. 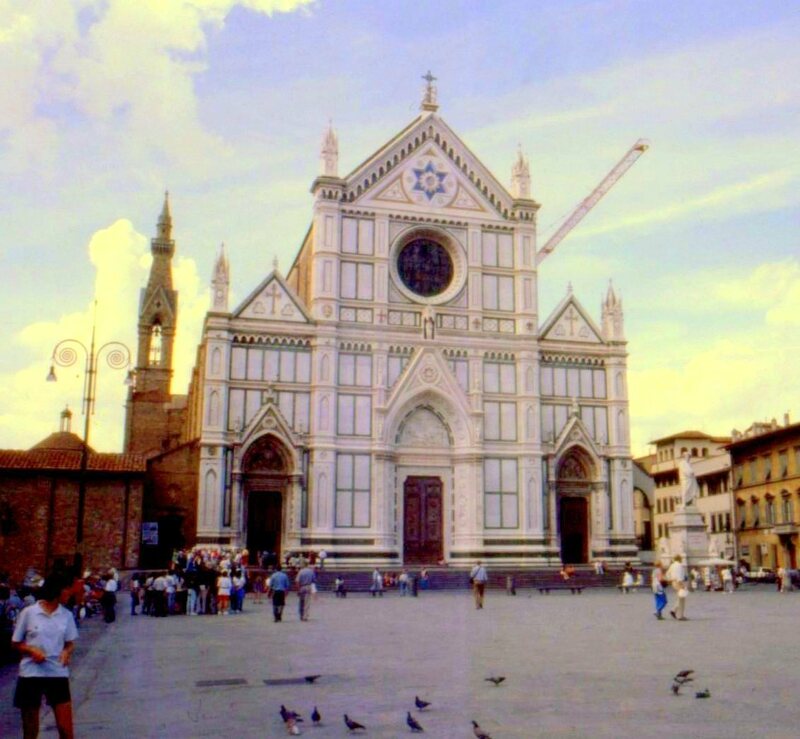 Santa Croce is the burial place of notables including Michelangelo, Galileo, Machiavelli, Gentile and Rossini. 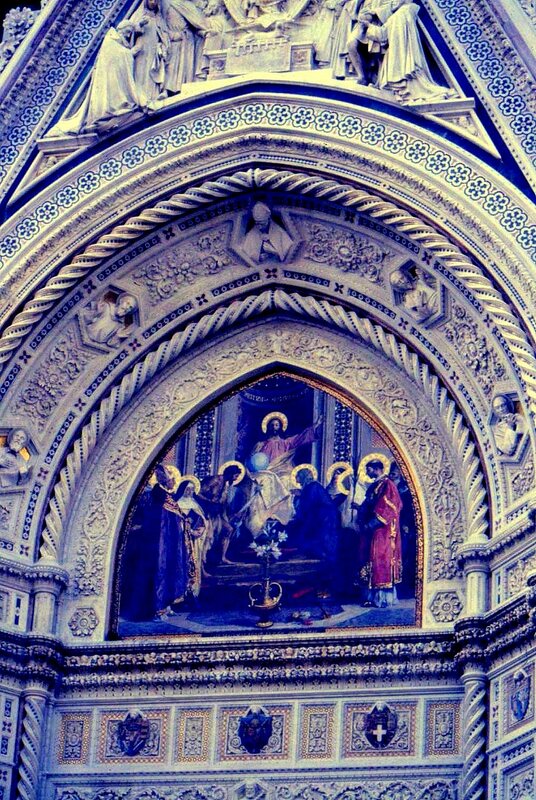 Santa Croce Basilica, Florence, Italy. It’s an interesting bit of historical trivia that the basilica’s 19th-century neo-Gothic facade was designed by Jewish architect Niccolo Matas, who worked a Star of David into the composition. As a non-Catholic, he was denied permission to be buried among his peers within the church’s walls, and was instead buried under the porch. 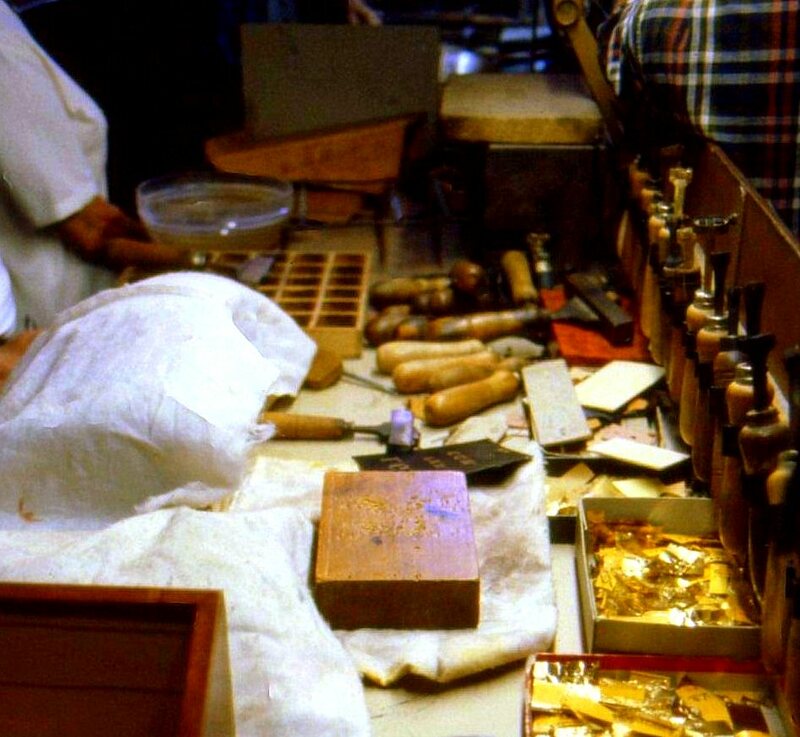 Gold leaf workshop, museum at Santa Croce Basilica, Florience, Italy. 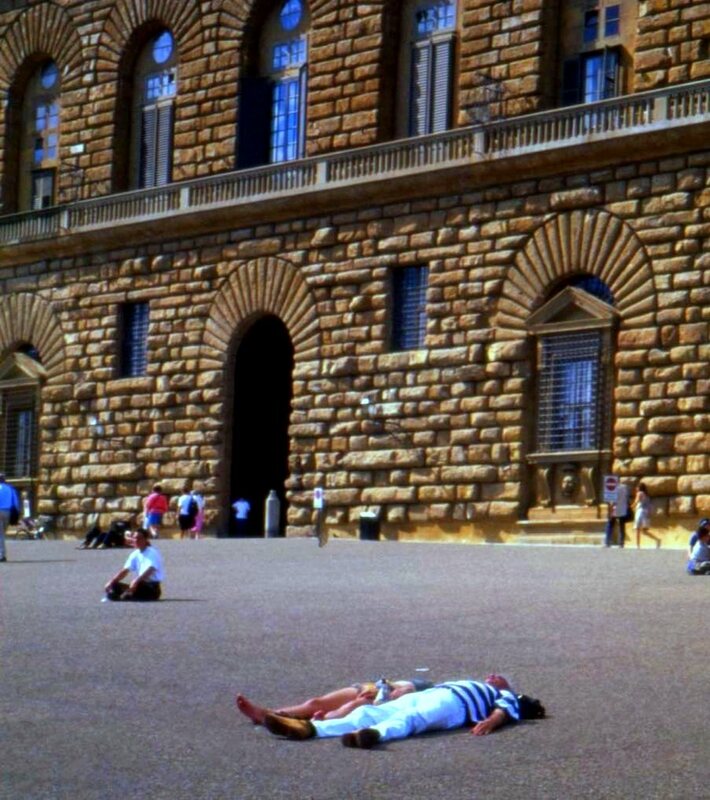 Tomorrow is reserved for a visit to the nearby Boboli Gardens.